Lindsay Emory began her career as a lawyer but now writes romantic suspense, mysteries, and romantic comedy. She hosts a popular podcast Women with Books about genre fiction written by and for women. Lindsay lives in North Texas with two big dogs and her romance hero, drinking gimlets and raising two STEM warrior princesses. "'Happily ever after' gets a refreshing update. This imaginative, absorbing, and empowering story is a must-read." "Whip-smart, engaging, and relatable, The Royal Runaway is an all around delightful must-read romance. I couldn't put it down!" "The Royal Runaway is paced as swift as a speeding bullet, showcasing evocative action and an edgy romance. Absolutely killer!" "Filled with intrigue, romance and a kingdom that feels real enough to visit, The Royal Runaway is sure to delight. It's a thoroughly modern fairy tale with characters whose motives will keep you guessing until the final pages. Prepare to be charmed by Thea, a duty-bound princess with an independent streak." "Thea feels like Meg Cabot’s Princess Mia flung into a John Le Carré novel as she deftly balances the humiliations a princess must endure with the far graver stakes of international spy-craft... 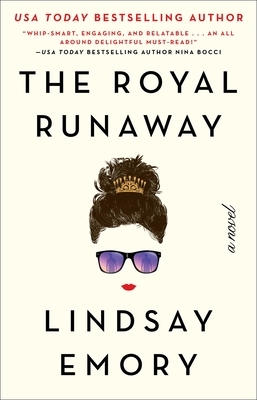 The Royal Runaway should whet that appetite while providing a tantalizing (and entertainingly sarcastic) glimpse behind the decorum of the public face of a monarchy."